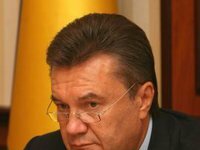 Ukraine and Russia should strengthen cross-border and inter-regional cooperation, Ukrainian President Viktor Yanukovych has said. "We definitely need to develop these areas, which create convenient conditions for the people," he said at a meeting with Russian President Vladimir Putin in Moscow on Tuesday. Yanukovych said constant attention should be paid to the issue of cross-border and regional cooperation.